EDINBURGH (Reuters) - Britain warned Scotland on Thursday it would have to give up the pound if Scots voted to end the 307-year-old union with England, declaring the currency could not be divided up "as if it were a CD collection" after a messy divorce. In one of the boldest attempts yet to scuttle a Scottish nationalist bid to break the union, finance minister George Osborne bluntly warned Scots that secession would cost them dearly in jobs and business. 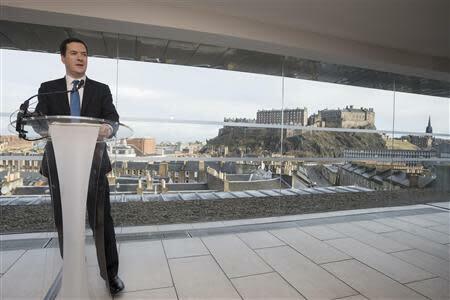 "If Scotland walks away from the UK, it walks away from the UK pound," Osborne told a group of about 200 business leaders in a hotel penthouse with a panoramic view over the Scottish capital, Edinburgh. Scottish First Minister Alex Salmond accused Osborne of "bluff, bluster and posturing", and said his words would backfire on him as a September 18 referendum approaches. 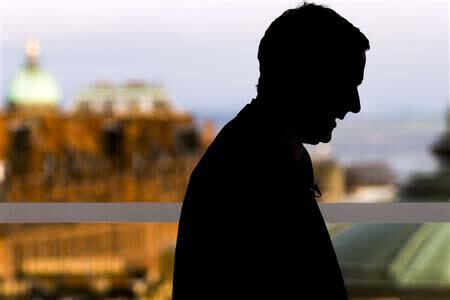 Refusing to be drawn on whether his toughened stance would antagonize some Scots, Osborne said Scots needed to be clear on the facts before making their biggest decision in three centuries. "The pound isn't an asset to be divided up between two countries after a break up as if it were a CD collection," Osborne, Prime Minister David Cameron's closest ally, said. "The evidence shows it wouldn't work. 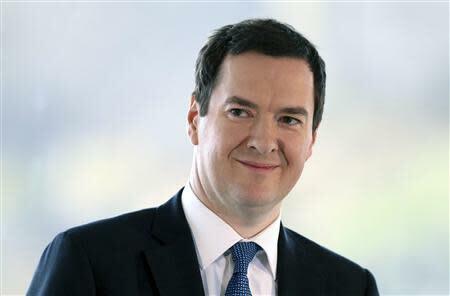 It would cost jobs and cost money and wouldn't provide economic security for Scotland or for the rest of the UK," Osborne said, waving a new Treasury analysis setting out the risks. The message was aimed at undermining the economic case for independence and one of the Scottish National Party's (SNP) key proposals - that an independent Scotland would keep the pound. It comes as opinion polls show separatists are still lagging supporters of the union but that the gap is starting to narrow. The debate has intensified in recent weeks with Bank of England chief Mark Carney cautioning that a currency union would entail a surrender of some sovereignty. Cameron made a patriotic case for unity last week which was dubbed a "love-bombing" by commentators. It is the first time the main parties in Westminster have launched a unified campaign against Scottish independence and Osborne stressed this meant a currency union was off the table, whoever held power after Britain's 2015 general election. Nationalist leader Salmond raised accusations of bullying against Osborne and the finance chief of Labour, Ed Balls, and Danny Alexander of the Liberal Democrats who also voiced opposition to Scotland sharing the pound. He said refusing to let Scotland join a monetary union would be damaging to the UK economy and a formal currency union was in the best interests of both the UK and Scotland. "This is a concerted bid by a Tory-led Westminster establishment to bully and intimidate but their efforts to claim ownership of Sterling will backfire spectacularly," he said. "The stance of any UK government will be very different the day after a Yes vote to the campaign rhetoric we are hearing now." Nationalists in Scotland, whose waters contain the European Union's biggest reserves of oil and gas, want the Bank of England to stay lender of last resort for financial institutions but have given no Plan B if not allowed to keep the pound. One possible option would be for an independent Scotland to continue to use the pound in a similar way that Ecuador uses the U.S. dollar ahead of a possible entry into the European single currency, the euro, at some later date. The SNP has indicated that if London prevented a currency union, an independent Scotland could refuse to take on a share of the UK's 1.2 trillion pounds ($1.99 trillion) of government debt which Britain has promised to honor. Salmond said all the debt accrued up to the point of independence belonged legally to the UK Treasury but Scotland has said it would meet a fair share of the costs of that debt. "But assets and liabilities go hand in hand, and - contrary to the assertions today - sterling and the Bank of England are clearly shared UK assets," he said. Osborne said the nationalist threat to walk away from its share of UK debt would mean punitively high interest rates for an independent Scotland and was an "empty threat". "In that scenario, international lenders would look at Scotland and see a fledgling country whose only credit history was one gigantic default," Osborne said. Whether the hard line on the currency will irk some of the 20 percent or so of voters still undecided in polls was to be seen. "For some people this stance on the currency gives clarity but for others it could be seen as antagonistic," said Alex Sanderson, who works in a professional services company in Edinburgh and intends to vote against independence. Polling expert John Curtice from Strathclyde University said he did not expect a major impact on the polls from this. "It might put the SNP under some pressure but voters in Scotland were already doubtful the monetary union would happen and I'm not convinced this will be a turning point," he said.